Last night i was on my way when I spotted something interesting and I wanted to take a photo of it. That turned out to be pretty hard, but I'm posting the best shots here. As I suspected last night, I wasn't able to get a photo of it today because there was a bit of fresh snow. 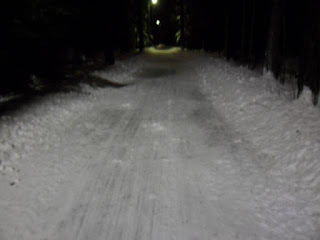 Here's a generic view: a bikeway through the woods, after 2100hrs (9 pm). The only light is from the streetlights above. Obviously the dynamo lamp does not give any light when stopped and the see-me led light does not give enough to be any use. Another shot, from a crouched position. A bit closer to the object of interest, but still not obvious what I'm trying to shoot. 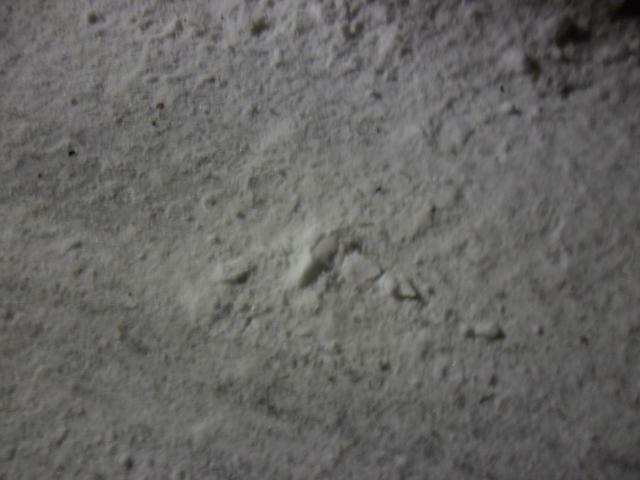 Here's a shot taken from the surface of the moon... or the bikeway from above. The object is clearly visible, but otherwise the photo is pretty boring. And what do these photos show us? A lump of snow on the snowy bikeway? Exactly! We're having a heat wave and the temperatures have been above freezing (+1C or +2C). That means that the trees are shedding the snow, and when the bikeway goes near trees they will get their share. 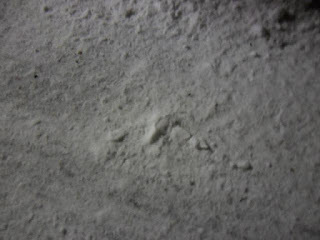 Now, a lump of somewhat fluffy wet snow falls a few meters. What happens when it impacts the ground? It won't be so fluffy anymore. And when it freezes, we have a pot-hill, a pothole in reverse. Inch or two high hills made of ice. Very nice! I thought it would drop below freezing during the night, but it didn't. And it looks like the temperature will be around freezing (-2 to +1) until Friday, and there will be snow and sleet, too. That means the lumps will not survive very long, as the warm weather prevents them from freezing properly and the snow means the snow plows will be around to clean the bikeways. Last week there was some days with a snowfall. 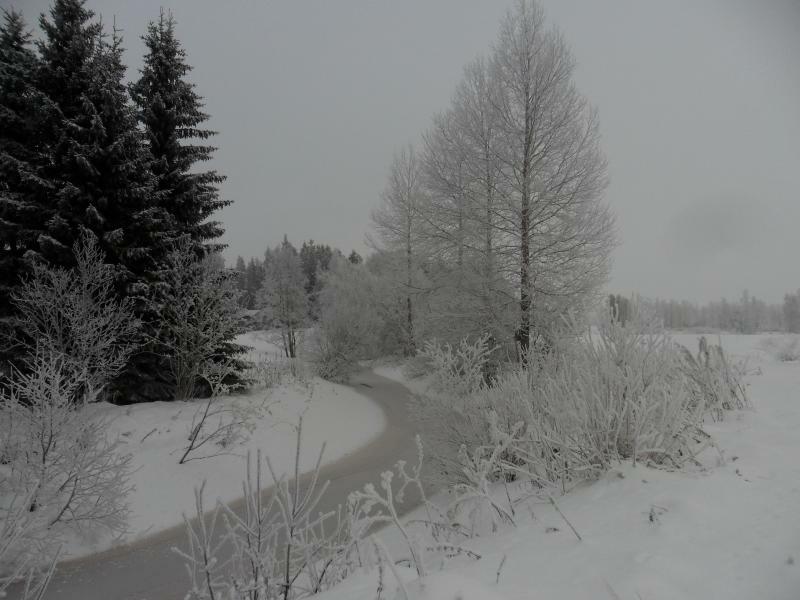 Like Saturday, which brought 10 or 15 cm of fresh white snow. In the afternoon the weather had cleared, and as I was riding to get some milk I got the camera out of my pocket and switched it to video mode and started filming. I chose a route (to view something new) that I don't take very often, even if it feels a bit shorter. The shortcut has it's own problems: two street crossings (with kerbs), a tight 90 degree turn, and I'm not sure it's even any shorter. On the other hand, the longer route has long stretches of straight bikeways with only one street to cross. Maybe it's the long straights make it feel longer? On the short cut route I can only ride 100 meters ahead before turning again. The trees lost the snow cover, but now they have gone white with frost. At the bottom is a new, thin layer of ice. With the warm days the water levels rose and water got above the previous ice covers. With a few days of proper cold it'll freeze and the river will have two ice covers, with water between them. Or if the water levels drop the ice will be hollow. That sounds really exciting while skating! And for now the ice is pretty smooth, too and there wasn't any snow on it. The last two pictures were taken on the same road, with a few hours between them. The temperature was climbing (from -15C) and there was some fog. And later there was some fresh snow. 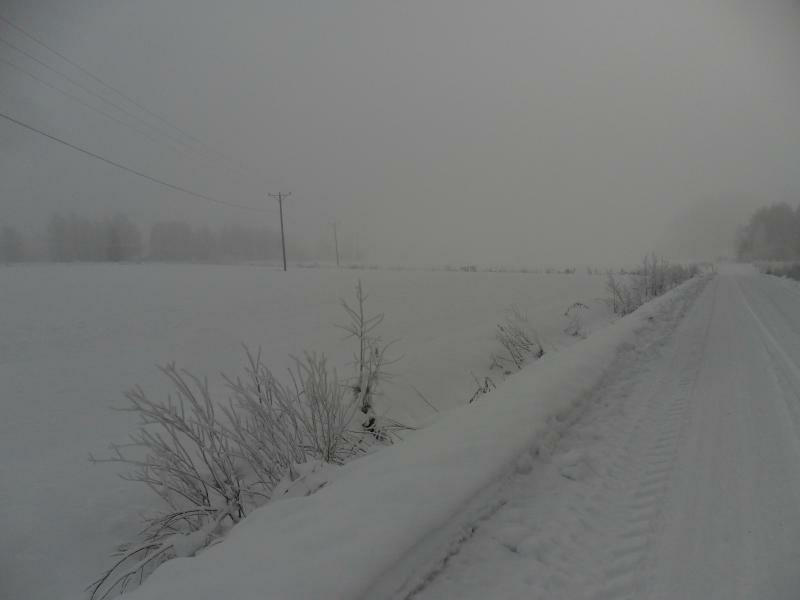 The road is a small rural road and it's plowed by a farmer/contractor who hadn't been very keen on the job during the warm weather period. 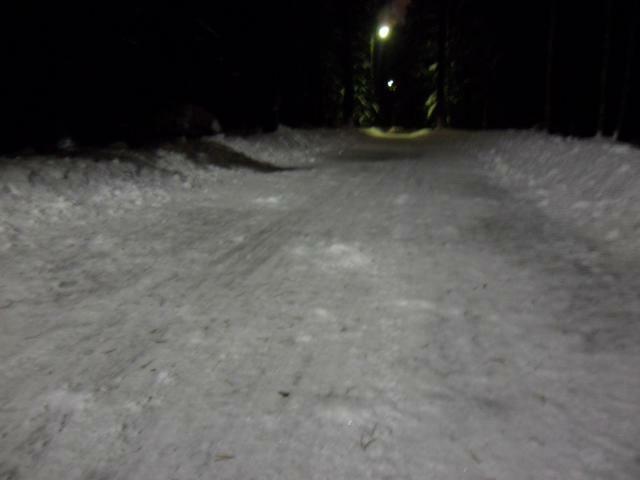 There had been a few inches of ice and snow on the road, and the top layer (inch or two) turned into slush. 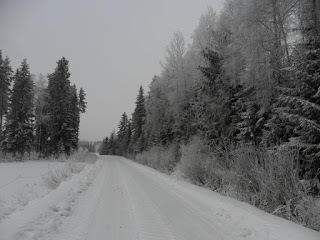 Then a few tractors and cars made some ruts on the slush to freeze. Not optimal for cycling. But I guess as it snowed he'll polish the road now but it's too late now, I'm not there to ride anymore.